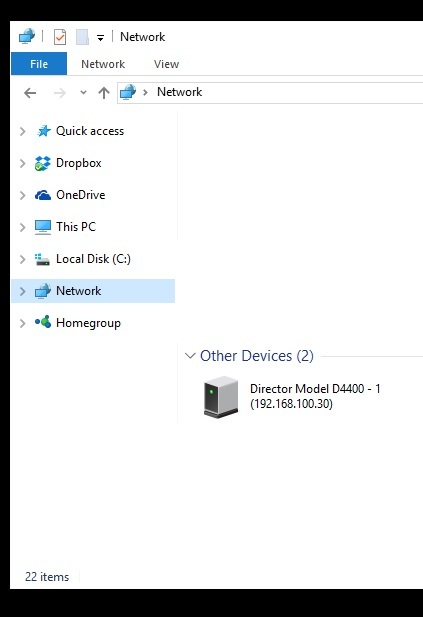 If you are running on a PC with Windows, the first thing you need to do is make sure “network discovery” is enabled on your computer. After you have confirmed that is enabled, you will then want to go to your Network Device list. If you’ve confirmed that network discovery is enabled, and its still not showing up, the next step is to check your network settings. 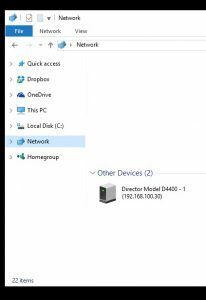 The Director is setup automatically for DHCP, so if it doesn’t see a DHCP network upon boot up, it will default to a static IP address, which is 192.168.0.249. You can also use a network scanning program to view all of the devices on your network and cross reference with the MAC address that is written on the back of the Director to confirm if it is actually IS connecting to the network or not. If you are planning to assign a static IP address to the Director, you will need to connect a computer directly to the amp and assign the IP address first, before connecting to the network. If you have checked all of this and it is STILL not showing up on your network, you will want to connect a computer directly to the amplifier and confirm you can talk to the amplifier directly.